By 2011, everyone was used to the concept that a song didn't have to be a single in the traditional sense to make it onto charts around the world. Artists - or rather, record companies - had begun to take that one step further by issuing multiple tracks in the lead-up to an album's release and in some cases, they'd all feature on the singles chart at the same time. With a debut single titled "Do It Like A Dude", Jessica Cornish was always going to get attention - but thanks to a seemingly endless stream of singles in 2011, she not only dominated the British pop scene, but broke internationally, reaching the Australian and US top 10 with songs like "Price Tag" and "Nobody's Perfect". For me, it took until Jessie J got the Max Martin and Dr Luke magic touch on "Domino", a new track on the platinum edition of debut album Who You Are, for her music to really connect. Here's someone who released as many singles as Jessie J in 2011 - in fact it seemed like Bruno Mars released just about every song from his debut album, Doo-Wops & Hooligans... except this track, which was actually my favourite on the record. "The Other Side" wasn't even a promotional single, like "Runaway Baby" (number 69 on this list), but both of them were passed over for full single status in 2011 for the Jason Mraz-lite of "The Lazy Song" and "Count On Me". In 2011, Kelly Clarkson finally achieved what had eluded her for so long: an Australian number 1 single with "Mr Know It All". The chart achievement coincided with yet another promotional tour to these shores, during which I got to interview Kelly for the third time. However, it was follow-up "What Doesn't Kill You (Stronger)" that I preferred - and so, too, did America, with the track becoming her third US chart-topper and the highest selling single of her career to date there. Before there was McBusted, there was NKOTBSB, a supergroup formed by the existing members of New Kids On The Block and Backstreet Boys (i.e. no Kevin Richardson) for a tour that eventually brought them to Australia (it was awesome!). While most of the concert and the accompanying compilation album was comprised of tracks performed by each boy band separately, the nine members did unite for a couple of songs, including the old school power pop of "Don't Turn Out The Lights". This segue writes itself, doesn't it? From New Kids On The Block (and Backstreet Boys) to pop's new kids on the boy band block - and a group created by the powers that be on the UK version of The X Factor. 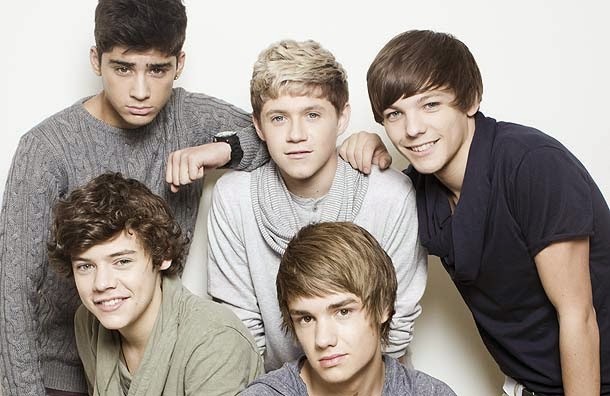 One Direction have gone on to amass a huge amount of hits, bad hairstyles and tattoos, but in 2011, they were just five fresh-faced lads with the catchiest bubblegum pop ditty of the year. Naturally, "What Makes You Beautiful" came from Sweden, with, among others, ex-Cheiron writer/producer Rami Yacoub responsible for the song - and facing criticism that it ripped off Grease soundtrack hit "Summer Nights". Written way back in 2007 when Lady Gaga was working on her debut album, "Hypnotico" never ended up being released by Gaga or any other artist at the time, but in 2011, Jennifer Lopez added the song as a bonus track to her album Love? while recording with producer RedOne (who'd co-written the song in the first place). I can't help but think that "Hypnotico" would have been a more successful follow-up to her 2011 smash, "On The Floor", than either "I'm Into You" or "Papi" turned out to be. The original version of this single by American synthpop trio Human Life was already quite good - sounding like a cross between La Roux and Eurythmics' "Sweet Dreams" - but add a remix by Grum (who we saw in my top 100 for 2010), and it became one of my favourites for the year. Unfortunately, the band comprised of vocalist Rachael Starr, and Joshua Collins and Matt Wasley has yet to live up to this potential. On the show, the New Directions wrote the track themselves for nationals, but in reality, the producers behind the Glee soundtracks teamed up with - who else? - Max Martin (and some other Swedes) for the cast's first original release. "Light Up The World" is everything you'd expect from such a collaboration - joyously uplifting, flawlessly harmonised and catchy as all get out. Like One Direction, Olly Murs is another non-winner of the UK's version of The X Factor who's gone on to do incredibly well. Runner-up of the sixth season in 2009, Olly's success has eclipsed that of winner Joe McElderry (who we saw in my top 10 for 2010) with three UK number 1 albums and four number 1 singles, including this lead release from second album In Case You Didn't Know. Thanks to the addition of British rap duo Rizzle Kicks (who were replaced with Chiddy Bang for the US release), "Heart Skips A Beat" showed Olly was more than just another Jason Mraz imitator and an artist to watch. She'd follow in the footsteps of Adele, Jessie J and Ellie Goulding by winning the BRITs Critics' Choice Award in 2012, but in 2011, Emeli Sandé (whose real name is actually Adele) was just another singer trying to get a foot in the door with some well-timed collaborations and this debut single, which was deceptively not that indicative of the massive-selling album, Our Version Of Events, that'd follow. She did it! After years of trying, Nicole Scherzinger's solo career really got off and running in 2011. This single hit number 1 in the UK, made the ARIA top 20 and even dented the Billboard Hot 100 - and more hits followed, including "Wet" (number 38 on this list). Her debut album, Killer Love, also featured another, er, killer song in the form of its title track (number 62). Shoegaze (or nu gaze), dream pop, synthpop... the music of French electronic band M83 had been categorised under a number of genres since they emerged in 2001, but for their first decade releasing music it didn't really matter how they were classified since not many people were listening. That all changed in 2011 with the release of "Midnight City", the lead single from sixth album Hurry Up, We're Dreaming, which has been heard in numerous films, ads and TV series since then. Barely pausing for breath, Lady Gaga released her second full studio album, Born This Way, in 2011 and was one of the first artists to fully utilise the promotional single strategy I mentioned at the start of this post. Following the album's title track (number 31 on this list), Gaga flooded the market by issuing "Judas" (number 35), "The Edge Of Glory" and "Hair" (number 91) in quick succession. Subsequent official singles "Yoü And I" and "Marry The Night" (number 41) kept her in global charts all year, and by the end of 2011, a sense of Gaga fatigue had set in. My favourite of all her 2011 singles, "The Edge Of Glory" had an '80s power ballad feel (complete with a sax solo by the late Clarence Clemons) - but I can't help thinking it might have been a bigger hit had it not been a bit lost in the whirlwind of releases (and had a better music video). I've always been a fan of Will Young's music, but that was never more the case than when he teamed up with Richard X for his fifth studio album, Echoes, which had a more synthpop sound than anything he'd put his name to before. Two singles were released in 2011 - "Jealousy" (number 21 on this list) and "Come On" (number 79), a cover of the song by Kish Mauve, who'd also recorded the original of Kylie Minogue's "2 Hearts". But, my favourite track was "Safe From Harm", which continued in the same vein as Will's Groove Armada collaboration, "History" (which featured in my top 100 for 2010), but was never issued as a single. As enigmatic as Daft Punk, British synthpop duo Monarchy is comprised of Andrew Armstrong and Ra Black - and were tipped for very big things in 2010. That didn't end up happening and by 2011, Monarchy had been dropped by major label Mercury Records. Luckily, they found a new home with independent label 100%, and singles like "I Won't Let You Go" and "Maybe I'm Crazy' (number 14 on this list), and album Around The Sun got to see the light of day. You know a musical genre has fully crossed over when it starts popping up on tracks by someone as high profile as Britney Spears, who featured a dubstep breakdown in this lead single from seventh album Femme Fatale. Her best single since 2004's "Toxic", "Hold It Against Me" came from - yep, you guessed it - Max Martin and Dr Luke, who were also behind follow-up "Till The World Ends" (number 57 on this list), while Max co-produced third single "I Wanna Go" (number 33) as well. They dominated my top 10 for 2010, and British synthpop duo Hurts released another gem from their debut album, Happiness, in 2011. Unfortunately, "Sunday" had another less than successful foray onto the UK chart (it reached nunber 57), meaning the number 21 performance of "Wonderful Life" remains their best showing there (without the assistance of Calvin Harris). Now this was something I wasn't expecting - especially since "The Ballad Of Mona Lisa", the lead single from Panic! At The Disco's third album, Vice & Virtues, had been good but not great. But, not only was the hyper-energised "Ready To Go..." the best track on the album, but it was also the best single Panic! had ever released. Not that you'd be able to tell from how it charted around the world. In Part 2, I mentioned that Swedish star Robyn had a relatively quiet 2011, which was great news for sound-alike singer Vanbot (aka Ester Ideskog), who filled the void with a couple of classic synthpop singles, "Make Me, Break Me" and "Lost Without You" (number 22 on this list). No doubt, she also got sick of all the Robyn comparisons. In a year when Scandipop ruled my top 100, it makes sense that my number 1 song for the years comes from a Swedish synthpop duo. Formed by singer Stefan Storm and synth player Oskar Gullstrand, The Sound Of Arrows had made a name for themselves over the previous few years as remixers and through a couple of low-key EPs, and in 2011 released singles "Nova", "Magic" and "Wonders" (number 16 on this list) from their debut album, Voyage. I'm still waiting for a follow-up. That's it! I've counted down every single one of my year-end charts... just in time to start all over again with my favourite songs for 2014 in a few weeks. Thanks for joining me on my musical journey, and if you missed any of my previous posts, you can check them out by following the links below.